Occupy Together: who’s the 99 percent? 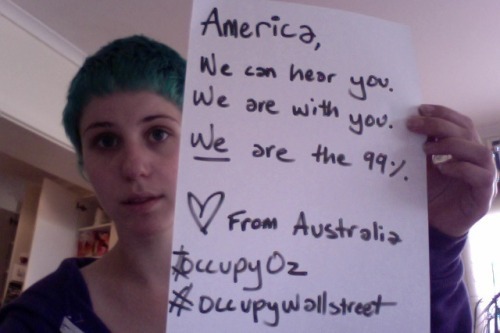 The Occupy Wall Street protests continue, and are now spreading to other places in the US and around the world, including Australia. In the process, some useful questions about solidarity and inclusion are coming up. Many of those who support Occupy Together (or some of their actions) feel, or are judged by others to be, uncomfortably well off. I’ve heard people say that protests in Perth or other parts are Australia are ridiculous because we’ve got very little to complain about here. And in many senses they’re right – the median household income in Australia and New Zealand in 2007/2008 was around US$45,000* (adjusted for purchasing power parity). According to the (not-entirely-accurate) Global Rich List, households earning the median income are within the top two percent of global income. And, of course, in Australia and New Zealand we have access to a reasonably-good-but-not-perfect healthcare system and welfare state. Similarly, there are people supporting Occupy Wall Street/Occupy Together in the US or elsewhere who may not be part of the one percent but are doing fine: good jobs, health insurance, a house and a car. Some of these people are wondering where they fit into the protests: whether they can legitimately claim to be part of the 99 percent, or even to be genuinely disenfranchised. As Sady Doyle writes in her excellent Biography of Class, people’s experiences of being part of the 99 percent are very different. For some, it means struggling to provide even the basics of life. For others, including myself, it means a standard of living that is incredibly high compared to that of most of the rest of the world. The difficulty of knowing where those who are well-off fit in with the protests is exacerbated by the lack of clarity in the movement’s goals (which I discussed in an earlier post). It’s easy (but not entirely accurate) to see the movement as a cry for help from those in the US who are pushed to their very limits, and if we do it can feel dishonest or exploitative to become part of the movement – as if we are claiming to suffer in the same heartbreaking ways that so many people are sharing on wearethe99percent. I don’t think this needs to be the case, though. We can recognise our own relative privilege while we support those who are struggling, as the two woman in the photos above are doing. We can use the advantages that our privilege gives us – money, education, connections, whatever else – to try to support change at the same time as we work to avoid eclipsing the voices of marginalised groups. We can recognise our similarities as well as differences with others in the 99 percent: even those who are well-off are often disenfranchised politically, frustrated by a system where citizens struggle to control corporate and financial power. The world cares what happens in US politics in part because we care about others’ suffering, but also because what happens in the US has consequences for the rest of the world. The US plays a key role in shaping climate action, financial regulation, economic globalisation, and foreign relations. Hopefully we’ll find ways to support the protests there that recognise the differences within the 99 percent as well as the similarities. 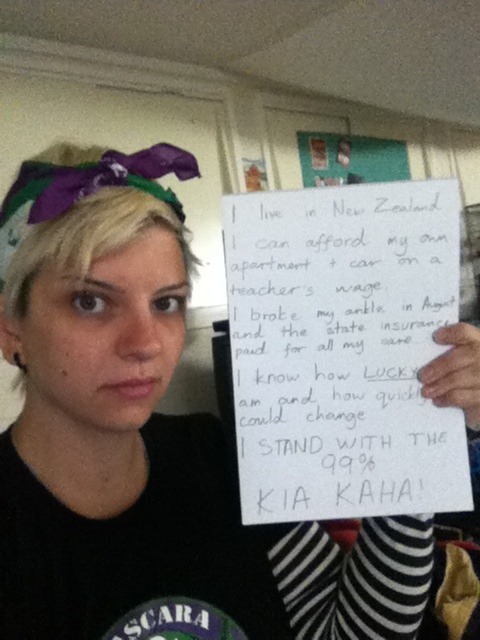 And hopefully the protesters within the US won’t forget the global 99 percent. * There are probably better figures out there, but I don’t think these need to be exact to make the point. Feel free to supply corrections! ** And more, of course, but the list was getting a bit depressing. It’s very noble of you to assume these Occupy protests are held *in support of* people in America who have been screwed by capitalism but from what I’ve seen that’s unfortunately not the case. Occupy Brisbane specifically states it exists to bring about financial reform in Australia. The Facebook page is full of people who I can only describe as arrogant and selfish who throw around Marxist-sounding sayings like “class traitor” in an insulting manner like confetti. If these protestors specifically stated they are in the 1% but support the motives of the 99%, I’d be behind them. At present, from what I have seen, that’s not the case and I am vehemently opposed to advantaged people pretending to be disadvantaged people because it’s “cool” to be seen to belong to an underdog majority. I don’t assume that all of the Occupyx protests are held in support of people in the US. In fact I think many of them aren’t really clear on what they oppose or support and are ending up a mishmash of different causes and justifications. The argument I was trying to make was that being clear on our relative privilege (as well as on what we share with people who’re more disadvantaged) provides a platform for solidarity: you don’t need to be struggling desperate to support the protests or to try to change problems with how our system works.